The Tribest Slowstar...It's a juicer! No, it's a mincer! No, it's BOTH! 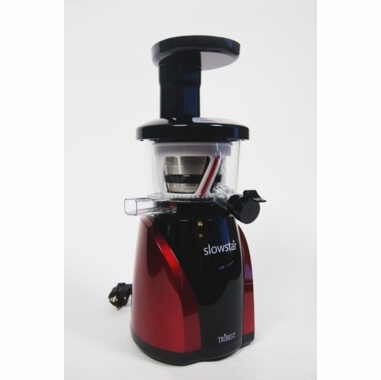 Enter the new Tribest Slowstar juicer and mincer 2 in 1 with Duoblade Auger. A revolutionary high yielding upright / vertical juicer that also includes mincer attachment for sorbets, sauces, frozen treats, baby food, and more! 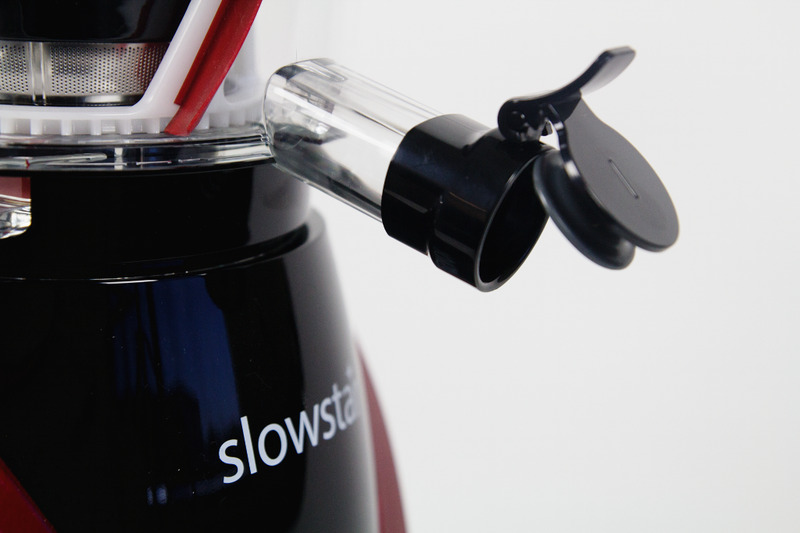 Others say "slow juicing" but when the Slowstar says slow, it means it. At an industry leading 47 RPM, it ensures the best yield of any slow juicer out there. Its 200 watt motor paired with 3 reduction gears produces an amazing equivalent of 9 HP of torque! Slow means less heat, less oxygen, and better juice. 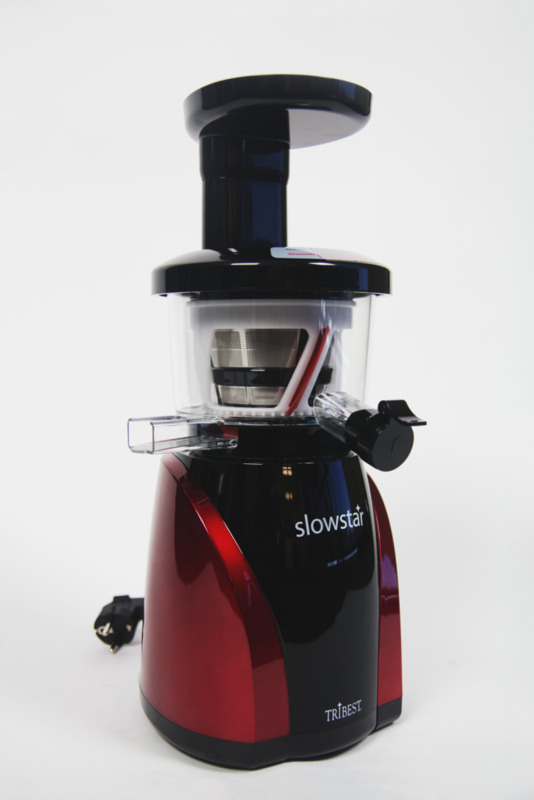 The Tribest Slowstar juicer and mincer's 47 RPM makes it one of the quietest juicers available. The Duoblade Auger works twice as hard at half the speed. Each pass of the auger presents a blade to grab and chew up, or masticate, each item you drop into the juicer. The double cut means less jamming and less pulp in your juice. Other slow juicers present only one blade edge, resulting in items just spinning around many times until you feed more produce into the juicer. Not with the Slowstar juicer. Feed single carrots or whole celery stalks into the juicer and in. No need to cut produce into smaller pieces like the other slow juicers out there require. It is because the others only have a single blade auger that requires you to cut things up into small pieces. Want to change from juicing to mincing? No problem, simply remove the juicing attachment, and replace with the mincer. Add the Duoblade auger and you're now mincing. No juicing screen required. While all juicers allow a certain amount of pulp through, including the Tribest Slowstar, we've included a stainless steel sieve that you place over the juice cup so that you can reduce or remove pulp to your liking. Other slow juicers don't offer the sieve in the package and try to control pulp with levers and caps. Not with the Tribest Slowstar juicer. Simply add the sieve/strainer and you control how much pulp you get in your juice. Be careful when using the strainer over the cup on the really fibrous stuff though, as the pulpy fiber will fill up the strainer quick. So be sure to watch the sieve and if it starts to fill up, just turn the juicer off and let it strain through, then tap the sieve into your sink or pulp cup, and start juicing again. The housing and casing on the Tribest Slowstar are 100% BPA Free, and the Ultem auger and screen are also virtually BPA free. Ultem is the only way to go for juicing screens and augers. At more than 8 times harder than the usual plastic, you can trust it will last, taking on some of the hardest (literally) veggies available. 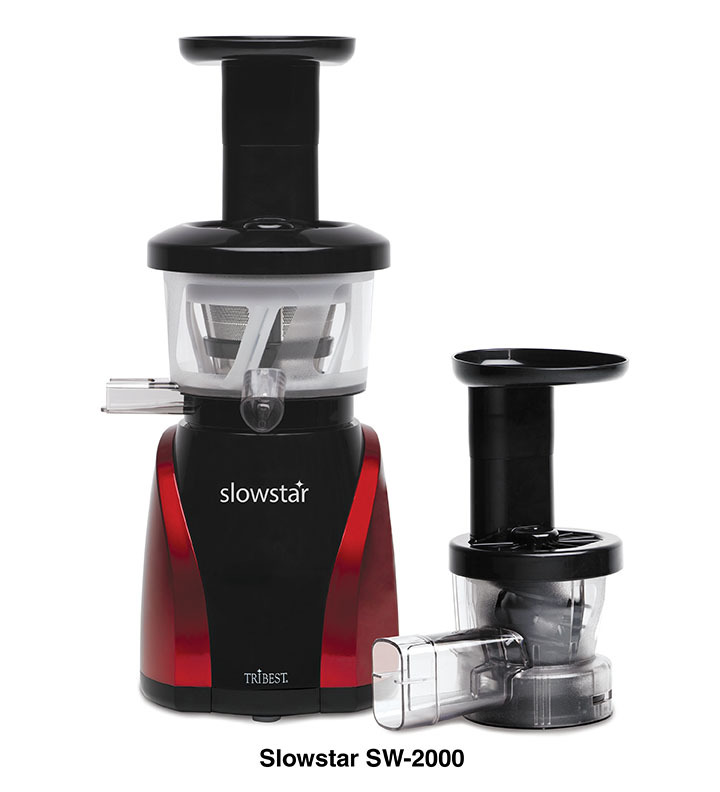 As usual, Tribest walks the walk, offering a full 10 year warranty on the Tribest Slowstar juicer, so you can trust it will be the last juicer and mincer you'll need to buy. Pleasing to look at with its red and black base; it's quiet, efficient, very well built--the parts are high quality and, no doubt, durable. It makes a very full tasting juice with very dry pulp coming out. The only issue I have with it is it puts a significant amount of pulp in the juice. This is easily remedied by straining the juice. The strainer that comes with the juicer is very fine and may be hard to strain the pulp with. However, I use a nylon nut milk bag and strain the juice easily. I really really like this juicer as it makes the best tasting juice of any juicer I've used, and the pulp is extremely dry. If you don't mind pulp in your juice or don't mind straining the juice, then this machine is for you. I've been juicing for over 15 years and have found this to be the most efficient juicer Ive used so far. I have been juicing for about 4 months now and the Slow Star was my first juicer. I was very pleased with the results (especially on harder veggies like carrots and beets!). I does however have some challenges when juicing leafy greens from a yield standpoint. I think it is an excellent choice for beginners and does deliver some quality juice with little pulp on harder veggies and with fruits like granny smith apples. I now have a Super Angel that I use for leafy greens and wheat grass but still use the Slow Star on occasion for my beet and carrot juice. Overall it is a good choice if your price point is under $500. It is a quality product with a 10 year warranty. I had a 15 year old juiceman juicer - this juicer is quite an improvement in that there is much less pulp material waste and it much drier so it produces much more juice volume per vegetable/fruit. also find the mincing attachment very helpful to crushing smaller more symmetrical pieces than food processor! Great machine - and quieter! This is my first juicer so I have nothing to compare it with. The juice is fine but not much volume for the amount of produce. A large mixing bowl of cut up veggies produces less than 2 cups of juice. There are lots of chunks in the pulp and the auger is crammed with chunks that will get thrown away. Once I tried to put the pulp back in the juicer but that made a huge mess. I'm wondering if it's because I'm using a recipe that was originally for a blender and you had to add water to get it started. Merchant's comment:No additional water is really necessary when juicing. We recommend leaving the juice spout cap closed until you are finished juicing. Many people are surprised at the amount of produce required to yield 2 cups of juice. Your usage sounds about normal, though it would depend on what you are juicing. We recommend alternating hard and soft veggies and fruit to improve the yield as well. This is a great juicer with a footprint that doesn\'t take up too much real estate on the kitchen counter. I still prefer my twin gear juicer for greens but it does softer veggies and fruits much easier than the twin gear. Overall it\'s an excellent addition to my kitchen.